In a "viability" study submitted as part of the planning process for the proposed Grove Farm development the market value of the land (with planning permission) is stated to be just over 9 million pounds. Clearly the development is going to cost a lot of money too but it looks like some £2.3 million of this money is already guaranteed for the 27 affordable and local needs houses. This leaves the remaining 27 "market-led" houses valued at £6.8 million or around £250,000 each. The viability report then goes on to consider the costs you would expect to see such as connecting to the electricity, water and sewerage systems and also a section entitled Community Infrastructure Levy (CIL) and Section 106 Matters which states that £432,000 has been allocated "to these matters"
This is planning jargon for money for community benefit and we can read more about this in the planning statement produced by the developers. The site has been identified as being the most appropriate site for development in the village by the Parish itself in the past and the designs respond to the vernacular and characteristics of Stradbroke. 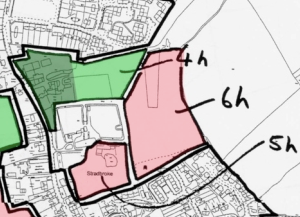 4h a brownfield site, would provide a village green (5h) for the community and fulfils all the other criteria. This scored the highest. d) Payment of a sum equivalent to the agreed agricultural value of the field due east of Stradbroke Hall together with an agreed sum for maintenance of the field for a period of 10 years. Parish precept. However, the Parish Council Working Party were anxious to enlarge and improve its playing field facilities at the Stradbroke Community Centre ground and as such the agreed sum could be provided to the Parish Council for this specific purpose and towards purchase of said land at the Community Centre. Now it is perfectly possible that if this development goes ahead then this would be a suitable use for part of the community benefit money of some £432,000 that this development would bring if it goes ahead. But the Parish Council has never agreed this. As a councillor I haven't even heard of it and nor has anybody else outside this "working party". Any community benefit this proposed development might bring should be something for the village to discuss and the Council to agree. Sadly once again we are seeing decisions make in private outside the accountability of formal council meetings.